what are your early fall favorites right now? I am very intrigued by this little trench. I hope you don't mind me asking what size you normally wear and how you find the fit on this trench apart from the length of the sleeves. The fact that it says size down for a neater fit on their website has me all confused whether I should be ordering a small or an XS. Thank you. Sue! :) i usually wear a US 0-2. sometimes i like to size up to an S in some of EL's basics for a slouchier fit, but i'm a true size XS. i hope that helps. it's somewhat roomier in the sleeves and through the body due to the A-line/swing shape, so definitely enough room to layer in the XS. let me know if you get this lovely little trench! I like the sage colour you have. If I manage to get my hands on one I will be sure to say. I need to get it shipped to me though so I have to rely on a friend's good will and that they don't sell out like they did the first time round. Much appreciated for the extra info. I have the XS as well and have stuck with an XS for all of my Everlane wares except for the box tee. I find that the shoulders are big on all of their shirts and so the XS works best for me...in fact, if the shoulders were just a smidge narrower on the trench it would be perfect! It's so cute on you, but just isn't my cut. I really want to try Everlane's shoes and cashmere, tho. 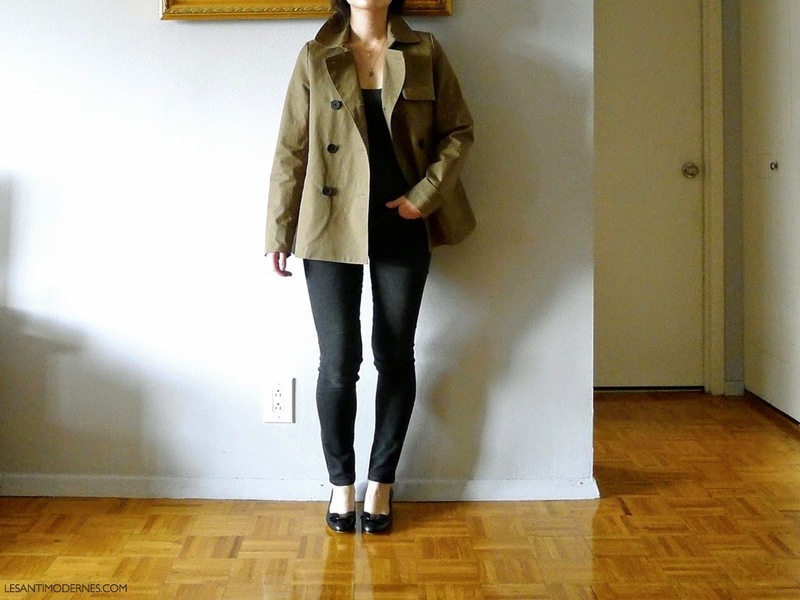 This swing trench looks great on you! I dismissed it when it initially came out, but you've given me reason to take a second look at it. That being said, I probably have more than enough coats :) Instead I've been pulling my trusty navy J. Crew quilted vest over my sweaters for extra warmth these days. That trench looks great on you. I'm in denial that summer is over, but with the temperatures dropping and darkness coming earlier in the day, I find myself reaching for my boots (Dieppa Restrepo) rather than my sandals. Also, I just bought a pair of Black Crane quilt pants and they're so comfortable. I'm looking forward to wearing those during the fall. i'm so curious about black crane. their fabrications always look so cozy and unique!